INTRODUCTION: Headlines warned people this week of the dire risks of a shorter lifespan by eating a low carbohydrate diet, but is it true? By asking a few simple questions it’s easy to see that this newly published study cannot be used to support this claim. Headlines are designed to attract readers to a story, to have people talking about it on social media and sharing it, so the way a study is framed is critical. Readers need to be discerning — to ask questions about the story so they can tease apart truth from significance. What do I mean by this? A fact can be true but really be quite meaningless, having little significance, which is often the case in these types of sensationalized reports. Let me give you an example to help explain what I mean. Let’s say there are 3 blond-haired 6 year old children and 2 red-haired 6 year old children in a room and one of the red-headed children slips on some water on the floor, falls and injures themselves, I could truthfully claim that injury rate of 6 year olds is 20% (1 in 5) but that the injury rate among red-headed children is much higher, at 50%. This is true, but is it significant? First of all the study groups were too small to make a comparison meaningful and that the child’s injury had nothing to do with them having red-hair and everything to do with the fact that there was water on the floor. Looking at the recently published study which claimed that low carb diets could shorten lifespan, there are several questions we need to ask ourselves to begin to determine if the findings were meaningful such as “how was the information collected”, “how many people were in each comparison group” and “were there confounding factors” (factors that could confuse understanding the data). Subjects were asked to complete a 66-item semi-quantitative food frequency questionnaire (FFQ) indicating how many times in the last year they ate specific foods. 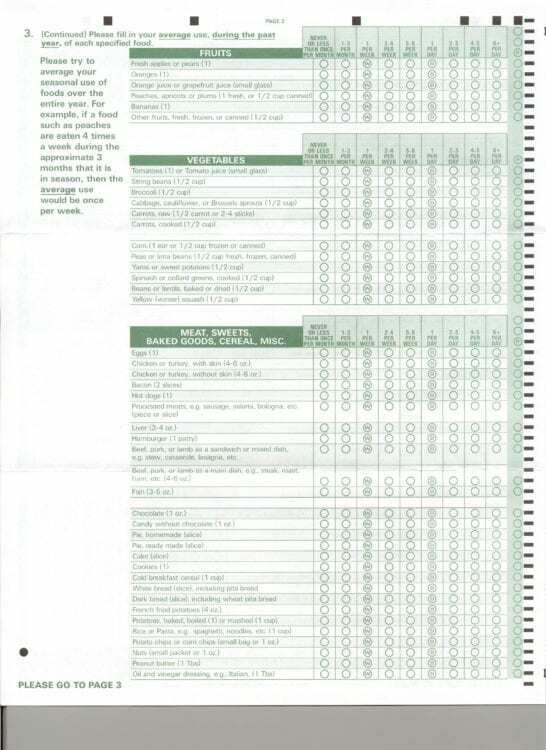 The FFQ it was based on was the 61-item Harvard Food Frequency Questionnaire, a page of which appears below. That’s right, people needed to estimate how many times in the last year they ate 1 oz of chocolate, or 1 cup of breakfast cereal or an ounce of nuts. Seriously?? How accurate would you be at adding up in your head all the 1 oz servings of chocolate that you estimated that you ate in a year. If you ate breakfast cereal in a serving size other than a cup, how would you even begin to accurately estimate how many 1 cup servings you had in an entire YEAR — including for breakfast and night time snacks? Thinking about this, one can see why FFQ data is considered very inaccurate and certainly can’t be used to estimate the percentage of carbohydrate a person has in their diet! The first part of the study took place between 1987 and 1989 and asked ~15,000 people between the ages of 45 and 64 years living in 4 communities in the US to complete the FFQ. The data from the second part of the study was a meta-analysis which combined the data from the first part of the study with data from 7 multi-national population studies using the same FFQ and the third part of the study took place between 1993–95. One huge problem with this paper was that it assumed that even if people changed their diet between the first visit in 1987-1989 and the third visit in 1992-1993, that people didn’t change their diets from the third visit until the data was analyzed in 2013; a period of ~20 years. There are all sorts of reasons people change the way they eat over time including health reasons (wanting to lose weight, for example), becoming parents, changes in economic situation, getting married and having someone else doing the cooking, or taking cooking classes! Assuming people ate the same way from 1993 until 2013 makes no sense. As with the risk of injury amongst red-headed 6 year olds in the example above, the way the groups are divided and how many people are in each group matters. A major problem with how the groups were broken up was that there were only 315 people that fell in the <30% of calories as carbohydrate group compared with more than 6,000 in the 40-50% of calories as carbohydrate group and the more than 3,000 in both the 50-55% and 55-65% of calories as carbohydrate groups. As with the risk of injury of being red-headed example above, the way the groups were divided and how few people were in the lowest group of carbohydrate consumption makes the higher relative risk of being in the lower carbohydrate group truthful, but meaningless. There’s an even bigger problem with this study. Researchers did not update the carbohydrate intake of subjects that developed heart disease, Diabetes, or stroke before the third visit. Let’s say that some people in the lowest carb intake group developed Type 2 Diabetes and went to see their public health Dietitian who recommended that they increase their carb intake to be around the recommended ~50% (45-65%) of their dietary caloric intake, or more. If they followed that advice and developed complications and died, their death would have been attributed to them eating a “low carb diet” rather than eating 50% or more of calories as carbohydrate over the subsequent 20 years. The same holds true with dietary changes that subjects made based on their doctor’s or Dietitian’s recommendation when they got heart disease or had a stroke. Because the groups were so lopsided in terms of size, being diagnosed with one of these serious conditions had the most impact on the lowest carb intake group because it was comparatively much smaller. There were other confounding factors including, as someone pointed out on Twitter, that there was no mention of analysis done on alcohol consumption in the paper, so there’s no way of knowing if higher death rates were associated with higher alcohol consumption. As well, there was a higher rate of smoking in the lower carbohydrate intake group, so were the deaths smoking-related or diet-related? There are many more problems with this study, outlined in depth by people such as Dr. Zoe Harbcombe but there is one glaring fact. Epidemiological studies (population studies) do not establish causation. When properly done, the results of epidemiological studies indicate that there may be a relationship between factors that needs to be tested in a randomized control trial. Nevertheless, researchers concluded that there was a ‘negative long-term association between life expectancy and a low carbohydrate diet’ (which they defined as a diet of <40% of calories as carbohydrate, which is not a low carbohydrate diet, but a moderate-carbohydrate intake. How the dietary information was collected, how the comparison groups were set out and the how the subjects were distributed amongst those groups and the multiple significant confounding factors make it impossible to conclude that a low carbohydrate diet shortens lifespan. There are many studies and meta-analyses using a low-carb intervention that span 18 years that are outlined in 76 publications involving 6,786 subjects and that include 32 studies of 6 months or longer and 6 studies of 2 years or longer that demonstrate that low carb diets are both safe and effective. You can read more about that here. Do you have questions about whether a low-carbohydrate diet would be appropriate for you given your health goals? Or do you wonder medical conditions you may have or medications you may take factor in? Please send me a note using the “Contact Me” form and I’ll be happy to reply. I provide both in-person services in my Coquitlam (British Columbia) office as well as Distance Consultation services (via Skype or long distance phone) and would be happy to help. Next PostNext Is Coconut Oil Pure Poison?